Like it says at the beginning, I walked into the shop one day ready to be blown away, and saw a sled with a shorter tunnel. I didn’t see the big deal right then. 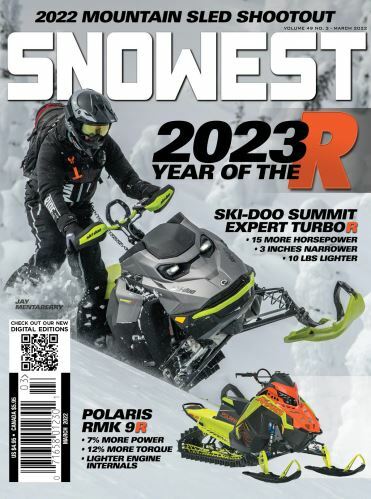 Of course, we’ve ridden sleds with chopped tunnels off and on since 2013, and ridden without snow flaps off and on since Ski-Doo made triple-shock rear suspensions. So the introduction presentation was interesting, but underwhelming. The shorter tunnel was intriguing, but the changes to the handlebars (2mm smaller grip diameter, shorter riser block and new handlebar grab strap), new shock package (kashima-coated shock bodies with new lightweight, high-strength steel coil springs, stiffer valving), new ski rubber (a new profile, new rubber composite material molded around a metal plate), slightly changed spindle (different bottom profile to adapt the new ski rubber and keep the ski flatter), new seat (the small and lightweight FORTY7C seat that was a Ski-Doo accessory this season), improved running board (more open for snow evacuation and traction) all seemed more like updates you’d expect to see across the Summit lineup rather than singled out as a new model. Then we hit the snow. And suddenly, I saw it differently. The very first thing I noticed was the vastly better suspension setup. I say vastly better knowing that the Summit SP and Summit X are not race sleds. Most of the riders who buy those sleds prefer a cushy ride. I (and many of you reading this) prefer a much more aggressive suspension spec. I was very impressed with how the Expert rides higher in the shock stroke and supports the front end in monster moguls. The shock action is smooth and plush, but ready to hit anything at full speed. The rear suspension absorbs the biggest hits and tracks straight without deflecting. This is the first Gen4 Summit I’ve felt I could blitz whoops on at wide open throttle. This shock package is superb. As we gained elevation and started picking lines into the hills, the next thing that really stood out was the change to the ski rubber and spindle. The ski stays very flat with the terrain, rather than pivoting and hooking the snow and turning the nose of the sled uphill. Even in bumps, the ski staying flatter seems to make the front of the sled stay on top of the moguls better. Every time the ski on a Summit or any sled stands up, it scrubs speed and shifts your weight forward. It’s like hitting the brakes. But we didn’t notice it until we got on the Expert, because it doesn’t do that. So the Expert goes through sketched out terrain noticeably faster because of that. Once we got into the mountain and the really deep snow, things got interesting. The Expert goes through deep snow like it has a 15-horsepower advantage over the other stuff. And it handles like a trials bike. That’s the tunnel/snow flap combo. First, the handling. Both the Summit X and the Expert can run a great line through tight trees, right? Fairly equal here, but the tighter you go, and the faster you want to ride, and the quicker you want to turn––the Expert has clear advantages. First, it’s more efficient at using the horsepower that is reaching the drive axle. It’s spitting most of the snow it’s chewing through out the back rather than recycling it through the tunnel. As the ground speed slows to a crawl, the Expert is tracking through fresh snow, while the Summit X is also fighting to chew through the snow that has compacted and cycled through the tunnel and been dumped out right in front of the track approach. It’s also not dragging a scoop (the Ski-Doo snow flaps are the longest and most rigid of the class) behind itself as it’s driving forward. Second, the snow flap and rear 5 inches of the tunnel are not dragging in the snow. That allows the sled to better dig down and find traction. And it allows for amazing pivot turns… you know the ones you see on Instagram where riders stand the sled up, spin around on the rear idlers and drive right back out on the track they came in on? Totally doable by just about anyone on the Expert. Third, the Expert rides like it’s about 30 pounds lighter. The tunnel carries significantly less weight in the form of pack ice and snow. We rolled the Expert over numerous times on our test rides to inspect. You could see the tunnel metal from corner to corner at the drive axle and above the track. All of that makes the Expert handle quite differently than the Summit SP or Summit X. Add to that the more comfortable grips, the lower bar riser (which gives you better control of the sled and chassis roll in technical riding), the seat and the other few changes. The net result is a mountain sled that is Summit in name, but a totally new sled in reality.